8x8 squares max 3-4 per square. 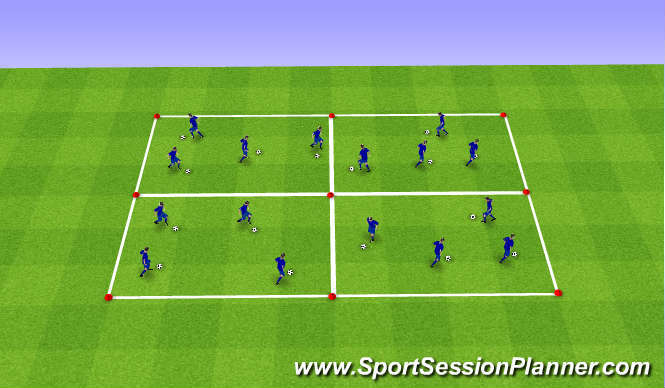 - Lots of touches using both right and left foot and different parts of the foot. Role ball back and push away with opposite foot, quick change of direction, fast feet and clean execution. Drag ball back with sole of foot take away with same foot, quick change of direction, fast feet and clean execution. Drag back push away with inside of same foot in direction of opposite foot, quick change of direction, fast feet and clean execution. Role with inside of foot towards opposite foot, fast feet, quick acceleration. Fast feet, balance and co-ordination. 10 in minute. Sequence: 1-2, 2-1, 2-3; 3-4, 4-3, 3-5. Start with 2 balls, progress to 4 balls. Change direction to work on both feet. - Receive ball on back foot. - Guide ball into direction of pass. - Soft ankle to receive. - Check shoulder prior to receive. 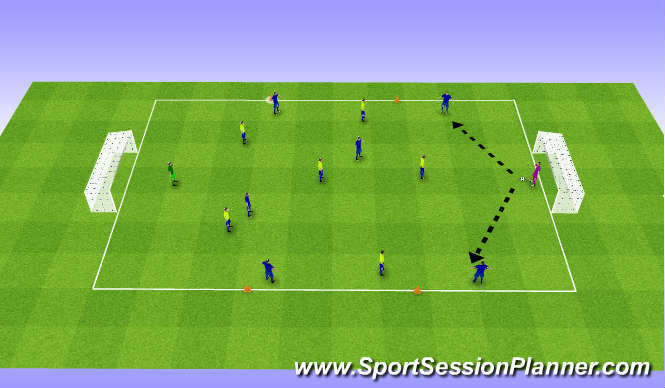 - Aim to pass in space between manequin and cone, to allow passer to step into pass. - Pass with nearest foot, nearest part (front foot?). Focus on fine detail of the receive, concentrations on techniques. Multi-station working on varying finishing techniques. GK cant enter area around Goal (red cones) but can close down player. 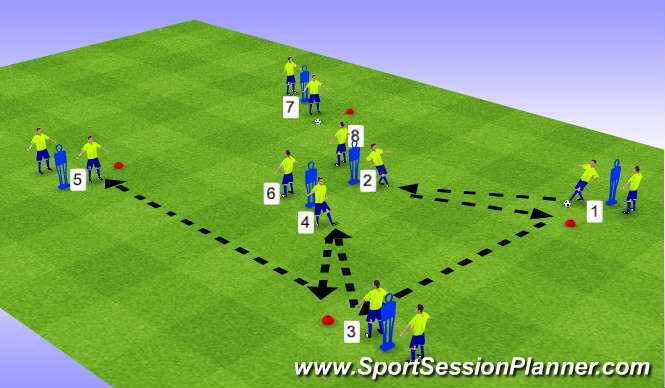 - pass into red player, set back, decision to take on or chip cones? What affects your decision on choice of finish? Ask...... who is best player in Prem who does this? Ball is played out from GK to Def, their aim is to succesfully play ball into Att who look to score quickly. If Def win ball counter attack quickly. GK cant be tackled, used for play rounds. When ball goes into Attacking half, encourage attackers can only play on 1 touch (dependent on age group make rule). - Body shape to receive/ play in 1 touch. Can be played without GK&apos;s encourage defs. GK must pass into def third to full back or CM. Encourage players to join in attack.